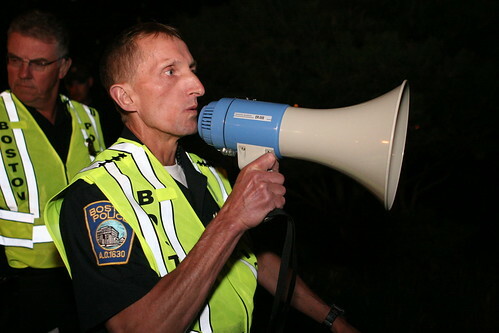 The Boston Police Department reportedly made no distinction between protesters, medics, or legal observers, arresting legal observer Urszula Masny-Latos, who serves as the Executive Director for the National Lawyers Guild, as well as four medics attempting to care for the injured. 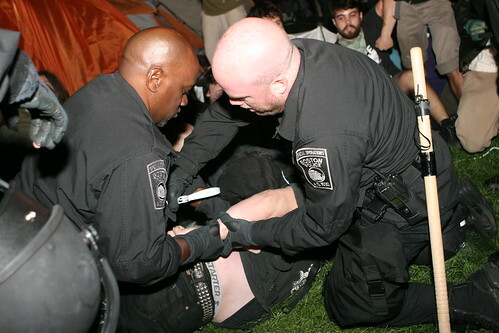 Some street medics, clearly marked with red crosses, were arrested despite repeated requests for medical attention from some of the protestors. 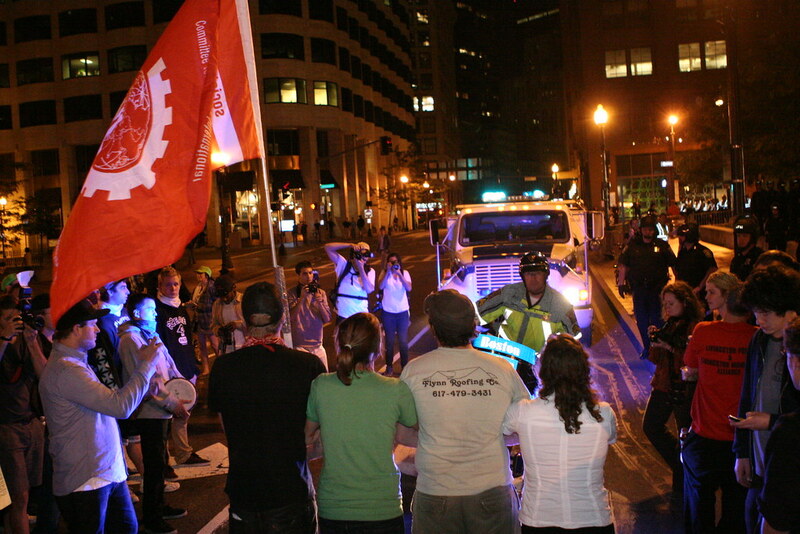 One street medic on the scene who was not arrested said that police refused to call EMTs. 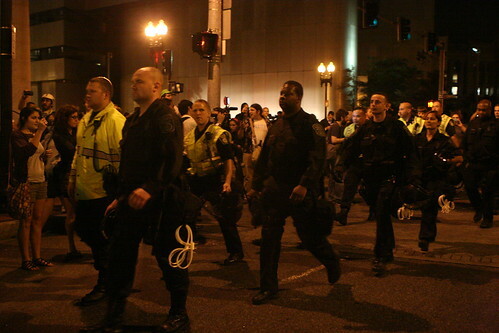 Following this massive outpouring of public support, dozens of police vans descended on the Greenway, with batons drawn, assaulting protesters and arresting more than one-hundred people. 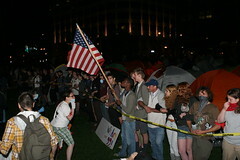 Members of Veterans for Peace carrying American flags were pushed to the ground and their flags trampled as the police hauled them away. Eye witness reports and video have come in showing that police dealt violently with members of Veterans for Peace who had come to support Occupy Boston. 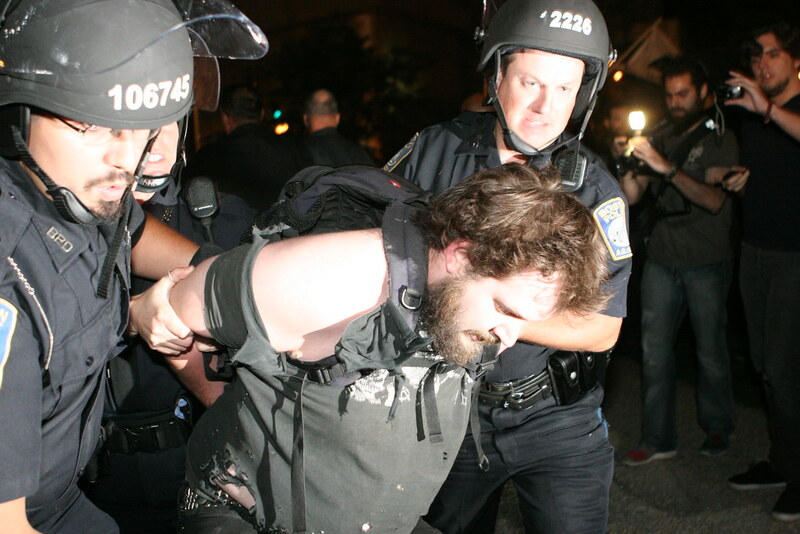 Other reports are still coming in regarding other instances of police brutality, but remain unconfirmed. 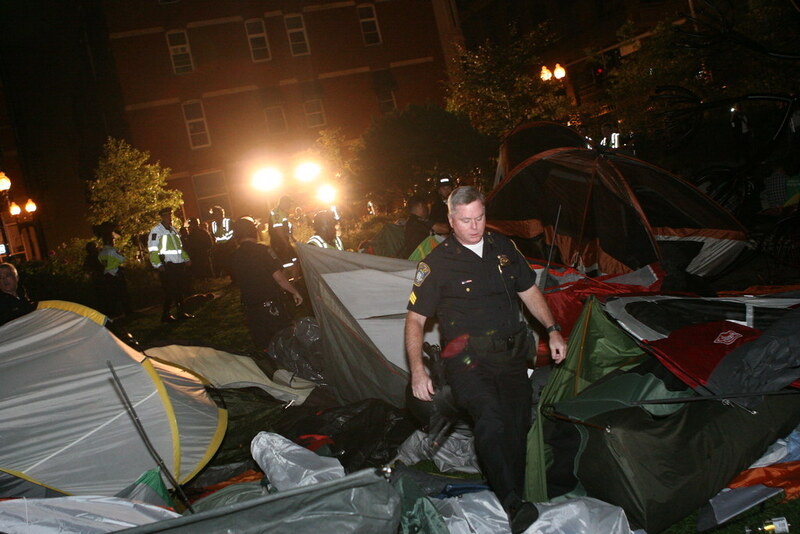 October 11, 2011. 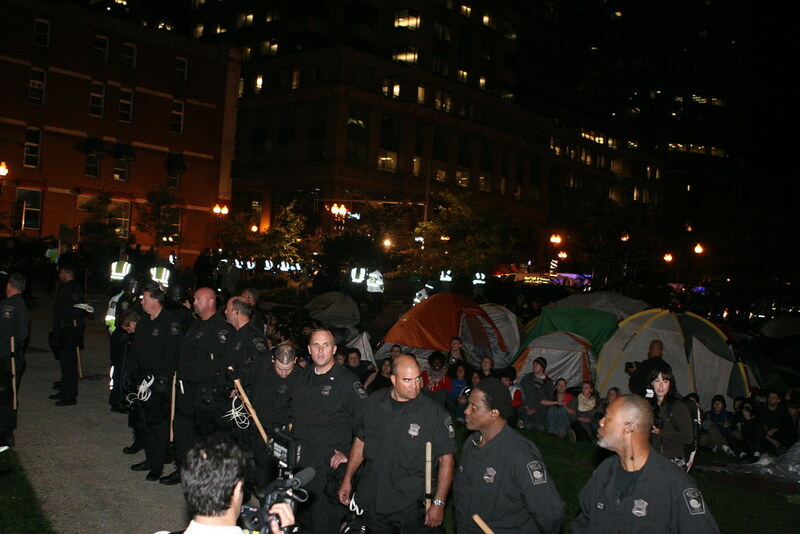 Occupy Boston – Police Raid – Photographs by Paul Weiskel. You can contact the photographer on Flickr or via email for licensing information. Images have been licensed under Creative Commons CC BY 2.0. 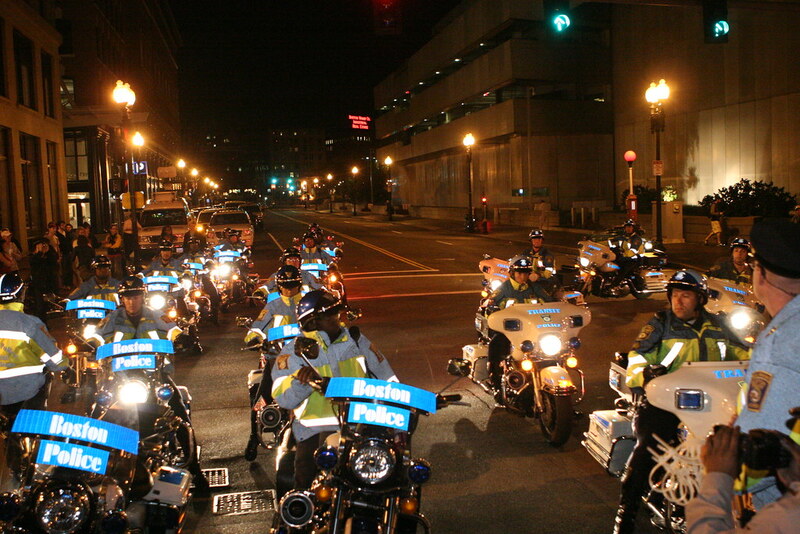 This entry was posted on Wednesday, October 12th, 2011 at 7:18 pm. It is filed under #OccupyWallStreet, Activism, MiseryXchord, photojournalism, Politics, World and tagged with #occupywallstreet, 2011, Boston, Occupy Boston, Occupy Wall Street, Paul Weiskel, police brutality, Police raid, Protest, USA, wide. You can follow any responses to this entry through the RSS 2.0 feed.